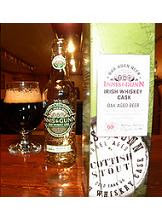 "This special bottling of Innis & Gunn has been matured in rare oak barrels from a famous distillery in Ireland. These barrels had been used to mature one of the great triple distilled Irish whiskeys. The result of this unique maturation is a big, full flavoured complex beer with a delightful warming finish. We hope you enjoy this beer as much as we do." This stout pours a very deep red, almost black. It has a two finger off white head that is thick with good head retention. The aroma is sweet with candy, dark fruit and slightly yeasty or bready. I also detect a whiskey note. This has a sweet caramel and some dark fruit up front. There is also chocolate and vanilla notes that are prominent. This stout finishes with an oak, hop and a lingering whiskey note. My overall impressions of this stout is great! This is very complex with quite a few things going on. It has a medium mouth feel and is very smooth. Although its on the sweet side I would have no hesitation opening a second one. Its not quite an imperial stout but it is an excellent example of an oak aged beer. I would rate this a 8.5-9 out of 10.